Did I mention I love artichokes? When most people see an artichoke for the first time, they are reminded of the giant man-eating plant ‘Audrey’ from Little Shop of Horrors. Artichokes have thorns that look like dangerous claws on the end of each fibrous leaf. Encountering them for the first time may be a little intimidating, bringing about a cautious apprehension present when attempting to break up a cat fight while naked. It is neither obvious nor intuitive how to approach eating an artichoke for the first-timer. 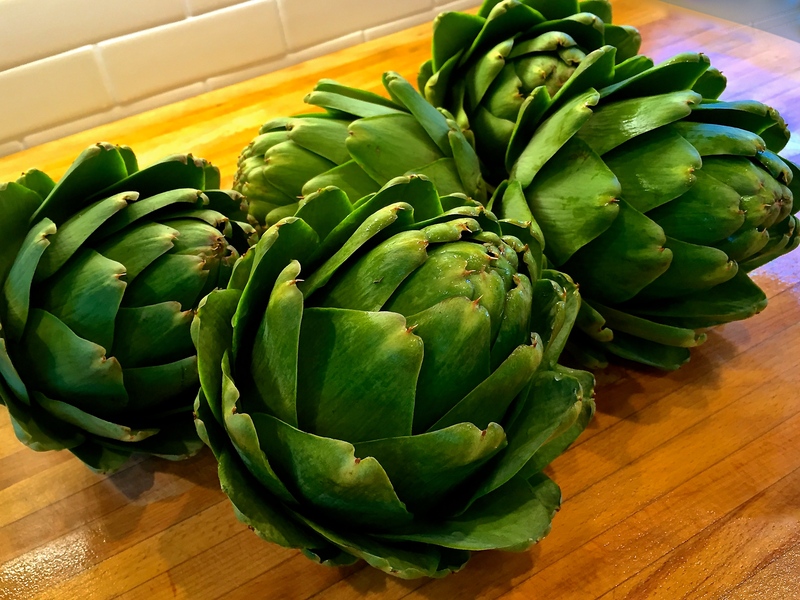 However, if you are fortunate enough to live in an area where artichokes grow, and you are in-the-know on just how to prepare and eat them, they are truly a glorious delight. We stumbled across this tapas restaurant in the Mission District of San Francisco. We weren’t even thinking about lunch, but the rich, earthy aroma coming from the kitchen lured us in like moths to the flame. The colorful, art-filled walls and the bustling atmosphere contributed greatly to the lively tenor. Our waiter Jose gave us a few thoughtful suggestions. We headed North on the Silverado Trail for a tasting at Rombauer Vineyards. After driving up the curvy, narrow road to the winery, we were greeted by a few colorfully painted cow sculptures and gorgeous landscaped gardens. The winery is located atop a sunny knoll surrounded by giant trees that offer the perfect shield from the bustling valley below. As we stepped from the car, a tranquil, quiet peacefulness overcame our senses and the playful sound of songbirds danced through the air. This naughty little monkey climbed my long braid just like it was a jungle vine and mounted my head, while whooping loudly. I’d swear all the female monkeys in the troop were laughing with delight. 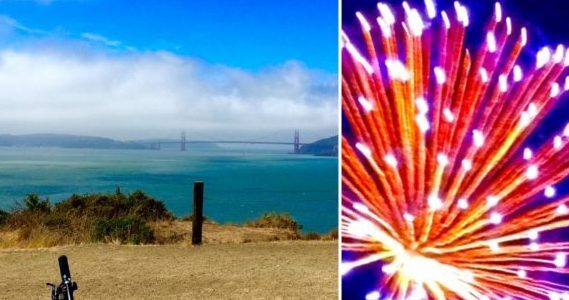 After visiting the San Francisco Botanical Garden during the annual ‘Flower Piano’ celebration, we headed over to Cha Cha Cha’s to experience incredible cuisine amid the chaos of blaring Latin music, devotional alters, and abundant laughter. The aromatic Cuban spices hang heavy in the air as the indigo walls of the restaurant envelop one’s senses. The kitchen is bustling with excitement while your stomach and your brain simultaneously define a divine hunger. Massive Mandala On The Beach! As we were driving along the coast, somewhere between Half Moon Bay & Santa Cruz, when we came across this huge mandala created on a sandy beach. A mandala (Sanskrit: मण्डल, circle) is a geometric concentrically structured pattern representing the cosmos or the universe. In many spiritual traditions the creation of a mandala is a practice to invite focus, meditation or an induction into trance state. Mandalas are also used to establish a sacred space. Traditional Burmese food is quickly becoming the rising star of Southeast Asian cuisine, surpassing even sushi and Thai food in popularity throughout the San Francisco Bay Area. Under the experienced guidance of Chef Max Lee, Rangoon Ruby captures the pure essence of authentic Burmese cuisine with flavors influenced by Thai, Indian and Chinese traditions. The plates are served family style (shared) and beyond being delicious with great, unique flavors, the presentation is lovely. Similarly, the décor of the restaurant is elegant and well thought out. The brightly painted fiberglass-and-steel sculpture stands approx. 60 feet (18 meters) in Rincon Park at the foot of the San Francisco Bay Bridge. Installed in 2002, the artist’s inspiration for this piece was San Francisco’s reputation as the ‘City of Passion’, invoking the mythological account of Eros shooting his arrow into the center of the earth to make it fertile. Many have commented that while Cupid’s bow is symbolic of love, the shape of this magnificent work also evokes sailing ships and the Bay Bridge itself. We began our second day in Napa with breakfast at the Boon Fly Café. This contemporary roadhouse restaurant has a fun, bubbly atmosphere and an eclectic menu full of scrumptious culinary options. Our morning dining delight started with an order of the signature Boon Fly mini-donuts. These cute, mini-sized wonders proved to be an excellent dipping partner for their rich, dark roast coffee. For my meal, I ordered the Chilaquiles with scrambled eggs. To my surprise, the eggs were outrageously light and fluffy, pairing beautifully with the deep seasonings and the freshness of the accompanying salsa. This combination made the dish a true winner in my book. We had an enchanting visit to Safari West in the heart of California’s Sonoma wine country recently, where this picture was taken. Commonly known as the ‘Sonoma Serengeti’, Safari West is comprised of 400 acres cradled in the mountainous area above Santa Rosa. Visitors are welcome to wander the trails and partake in the open-truck safaris to experience over 1000 exotic African species of mammals and birds within the natural habitat of this beautiful wildlife preserve. On a rainy day last December, we visited the Seymour Marine Discovery Center, which is affiliated with University of California, Santa Cruz. To celebrate the seasons, they had decorated the giant whale skeleton out front with thousands of Christmas lights. After out tour, the sun broke through the clouds and provided a lovely rainbow right over the facility. What a glorious treat! I am very fortunate to be married to an incredibly thoughtful man. Early last winter (late January 2014), I told Brian that someday I wanted to attend Alice Waters’ Black Truffle Dinner Event at her world famous restaurant Chez Penisse in Berkeley, California. Well, guess what? Eleven months later, I received an invitation to attend the 2015 event from my amazing hus-Bee. He remembered! 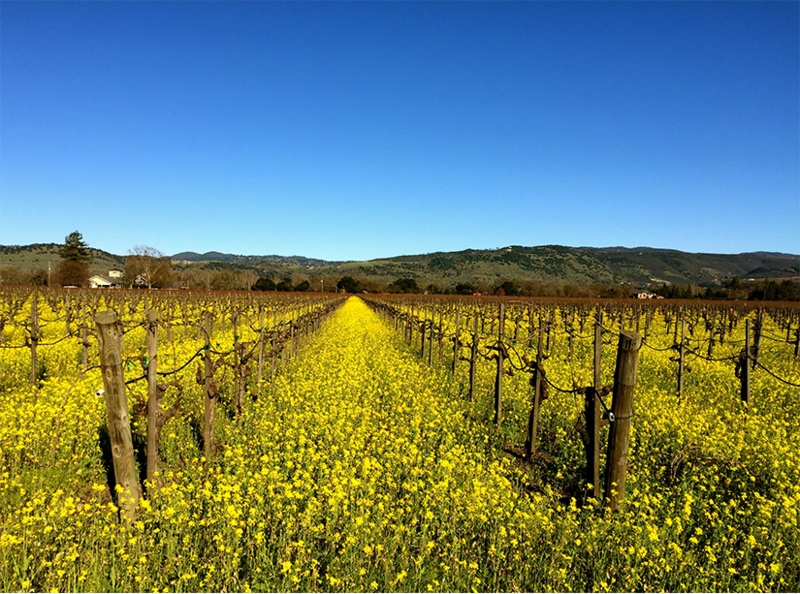 We had a few beautiful days to spend in Napa during the month of January. Our inspiration you ask? Seventy degree weather in the middle of winter! Frequently I forget that Napa Valley is just over an hours drive from the San Francisco Peninsula (approx. 70-miles). So, my partner in crime and I packed a small overnight bag and headed to the wine country! The Fire Octopus at the Maker’s Faire, San Mateo, California. This annual event is a perfect showcase of science, innovation, creativity and resourcefulness to celebrate the Maker’s Movement. The Maker’s Faire brings together scientists, teachers, tech enthusiasts, crafters, engineers, tinkerers and hobbyists to explore the realm of possibilities for the future. It’s taking place at the San Mateo County Event Center this weekend. Go out and experience this fun, family-friendly event! Enjoy!!!! Zuzu, located in Napa’s historic Old Town, has masterfully blended the culinary traditions of Spain and South America with the warmth of Mediterranean décor to create a true gem. The complex layering of flavor and spice in each dish was uniquely divine. Our server Darlene was very knowledgeable and made some fantastic suggestions for our maiden voyage at the restaurant. Zuzu’s signature sangria was delightfully fresh and fruity. Given the ease with which the first glass went down, I had a great appreciation for the speedy arrival of our first plates! We enjoyed the NASA exhibit at the Museum of Science & Industry while visiting Chicago recently. Brian really liked getting a feel for what it would be like to play in a space suite! This picture was taken at the Puerto Vallarta Zoo in Mismaloya, Mexico. Just prior to this photo being taken, the giraffe bent down and licked the sweat from the back of my ear!! Feeding a giraffe a carrot from my mouth was also a pretty thrilling experience! As we entered Prager Winery & Port Works we found ourselves surrounded by lush green gardens. Not the manicured, stately gardens of Domaine Carneros, rather, the kind of gardens surrounding a sweet country cottage far, far away. The dirt road leading to the winery is very narrow and easy to miss, so keep your eyes peeled as you approach on highway 29. Hotel Sofitel, Redwood City, California: Dale Chihuly’s Glass Chandelier. This amazing explosion of blue and green blown glass greets the eye in the lobby of the Sofitel hotel. 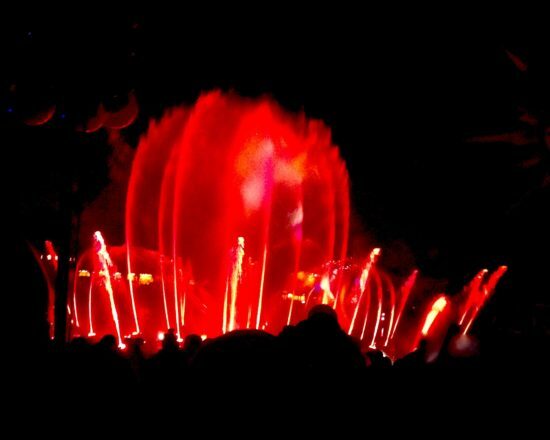 I first became acquainted with Chihuly’s ethereal mastery of glass sculpture while visiting the Monterey Bay Aquarium exhibition entitled “Jellies: Living Art” in 2002. Photography of his work is gorgeous, but viewing it with your own eyes is nothing short of pure magic! Rooftop of The California Academy Of Sciences, Golden Gate Park, San Francisco, CA. This was always my favorite place to go as a child. 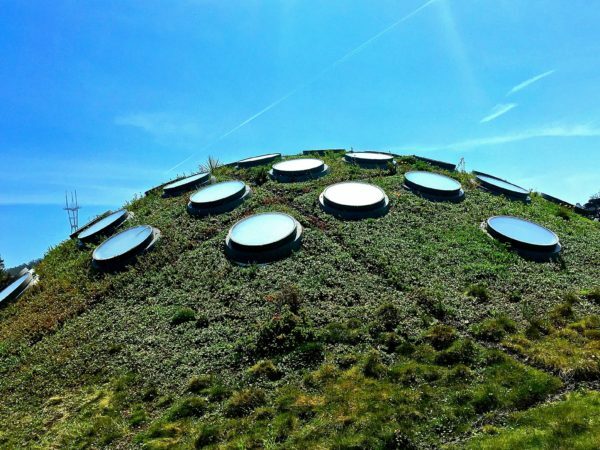 Newly remodeled in 2008, the natural science museum now features a living rooftop with over 1.7 million California native plants, which opens to allow natural ventilation throughout the building. If you get the opportunity for a visit, don’t forget to stop by the alligator pit and say ‘hello’ to Claude, the albino American gator. San Francisco Bay, California. The photo of the Stämpfli Express was taken by one of my talented masters rowing teammates Karen Gheno last December. I’m in the #7 seat from the bow (back/left side) of the boat!